Abu Dhabi: You have to be yourself to excel in public speaking, according to the 2018 world champion of public speaking in the international speech contest of the Toastmasters International (TMI), a global non-profit offering leadership and public speaking training. Ramona J. Smith, 31, a high schoolteacher from Houston in the US who outshined 30,000 participants to win the world’s largest speech contest, said at an event last week in Abu Dhabi: “It was a dream come true. That’s why [because of being the champion] I am here,” said Smith who was on a visit to the UAE, the first foreign visit after winning the title in August. She was addressing the 600th meeting of the Abu Dhabi Toastmasters, the first Toastmasters club in the UAE, which was established in 1995. “First thing I learnt is that it is not about the title.” She worked hard for it because it was an opportunity to listen to other wise people. “The second thing I learnt was just be myself. I was criticised that I was too dramatic and too theatrical [in the winning speech]”. However, Smith explained that the way she spoke was part of her trait and she won because she maintained her own personality on the stage. A few years back she did not know how to speak in public. “At this Club, I got my directions right and I just went ahead. Here I am today, standing tall as club president,” said Shaikh, a Pakistani engineer. Abraham Thomas, a founding member, presented the milestones of the club in a presentation at the event. Another founding member, Loyola Pinto, who was the master of the ceremony, said the club helped his growth as an individual and professional. A prominent founding member of the club, Dr B.R. Shetty, chairman of BRS Ventures, said Toastmasters helped him a lot in his business career. He said many of his colleagues also benefited by the leadership and the public-speaking training offered by the club. Sultan Al Hajji, a club patron and a senior toastmaster, said it is a good platform to be a good leader and a better person. He said Toastmasters made his life better and happier. Balaji Naglabhushan, district director of the TMI, said senior members of the ADTM club heavily contributed to the growth of Toastmasters in the UAE. He said, 20 years ago, he had gone to the stage without knowing how to speak. “Today I am humbled [as a confident public speaker] thanks to Toastmasters,” Naglabhushan said. Reena Althaf, vice-president education at ADTM, while unveiling the commemorative newsletter said she edited the newsletter in the record time of less than a week. “Now, that’s truly a magic, but I was driven by the challenge and inspired by Ramona Smith. With her amazing winning speech she has shown us that no matter what, we can have the power, we can voice out what we want to say and be who we want to be,” Althaf, said. Many professionals in the UAE have improved their professional and personal life with the public-speaking and leadership training offered by the Toastmasters clubs, a senior executive told Gulf News. 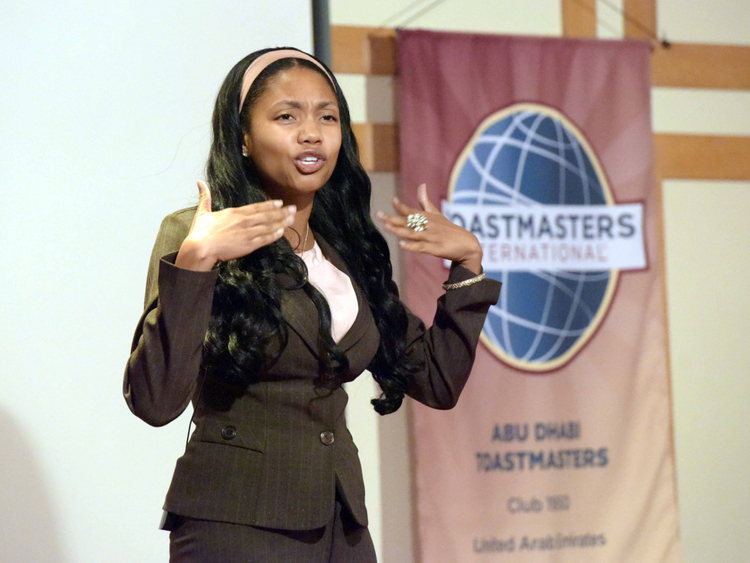 “Even very shy people have become excellent public speakers by attending the fortnightly club meetings,” said Balaji Naglabhushan, director of the Toastmasters International’s (TMI) district 105 that comprises four countries in the Middle East — Oman, UAE, Jordan and Lebanon. The non-profit clubs of the TMI charge a nominal annual membership fee between Dh400 and Dh1,000 and it is affordable to anyone as they have to spend just Dh33 — Dh83 per month, said Dubai-based Naglabhushan who has been with Toastmasters in the UAE for 20 years. The TMI has more than 357,000 members in 16,600 clubs across 143 countries. By regularly giving speeches, gaining feedback, leading teams and guiding others to achieve their goals in a supportive atmosphere, the TMI helps improve leadership and public speaking skills.